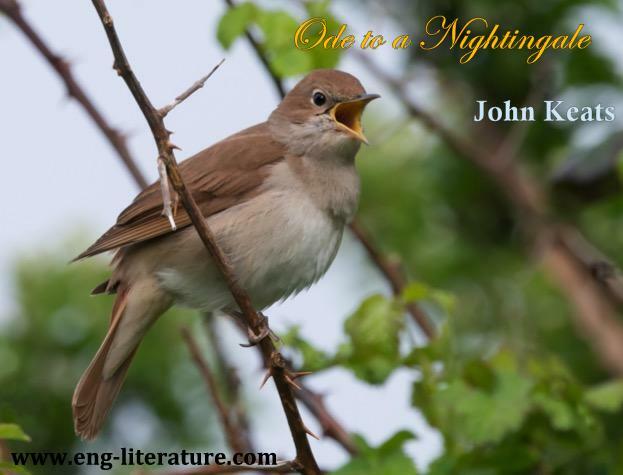 Analyses British Literature Broad Notes Escapism John Keats Ode to a Nightingale Poetry Is Keats' "Ode to a Nightingale" a poem of escape or a reflection of human experience? or How does Keats explore the capacity of the imagination to transcend reality in "Ode to a Nightingale"? Is Keats' "Ode to a Nightingale" a poem of escape or a reflection of human experience? or How does Keats explore the capacity of the imagination to transcend reality in "Ode to a Nightingale"? Escapism is the English Romantic Movement as affirmation by Keats and many other poets. Escapists run away from harsh, unpleasant facts and duties, thus try to hide themselves in their idle world of dream and peace. Yes, a note of escapism is sounded clearly in “Ode to a Nightingale” because the poet wants passionately to 'leave the world unseen' and with the nightingale 'fade away into the forest dim'. Escapism is the life and soul of romantic poetry. The romantic poets are all fed up with the hard, stern realities of life – its din and bustle, fever and fret. The realization that happiness in this world is but an occasional episode in the general drama of pain is too much for them to bear. Thus Wordsworth escapes to Nature, the vast world of flowers, trees, mountains, valleys etc. ; Coleridge to the mysterious world of supernatural, and Shelley to the Golden Millennium of the future. “Ode to a Nightingale” is a poem of escape into the dreamland cast up by Keats’ romantic imagination. The poet heard the song of nightingale. The song fills his mind with intense joy which borders no pain. Drunk with delight the poet wants to escape from the world of “the weariness, the fever and the fret” to the world of fantasy where evanescence of youth, beauty and love exist. Thus he hits upon different ideas like opiate himself, taking a small doze of hemlock, sinking into the river of Lethe, drinking wine but finally he transports himself to the ideal land of nightingale with “the viewless wings of poesy”. The poem reflects tragic human experience that human life is a tedious tale of sorrow, of hopes baffled and efforts disappointed. In this world few men live up to old age, and even those who are fortunate to live up to that age are struck with paralysis, and with a few grey hairs on their heads they hobble along trembling and tottering. Here he remembers the bitterness of his own life. The poet here thinks of his young brother Tom, dying just before his eyes. He considers that life is full of misery, sorrow and disease, of tiring struggle, of restlessness and pain; that life is nothing but a series of groans and complaints. The charm of loveliest woman fades away very soon, and the love of woman for her lover does not last longer. Here he remembers his beloved Fanny Browne’s rejection of his young love and turning to others. To toll me back from thee to my sole self”.